Voting begins at noon on 1st November and runs until midnight on 10th November. VERY IMPORTANT: You have four votes to cast, so please give all your 4 votes ("4 stimmen") for 3nity Brothers. After casting your votes, you will not be able to vote anymore during this internet voting stage (1-10 Nov). 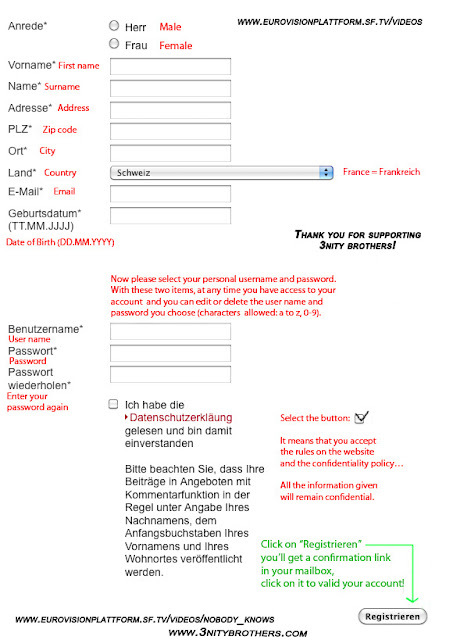 -> To vote, you need a USER ACCOUNT with SF website. All the information given will remain confidential. 14. Once you have registered, you will receive a confirmation email in your mail box, you’ll have to click on the confirmation link to validate your account. - Auf diesem Computer automatisch einloggen: click this box if you would like your computer to remember your password and stay logged in. 17. When you have allocated all four votes, click on "Absenden" ("Send") at the bottom of the page. This ends your participation in this voting stage. The entries that have qualified for the decider show will be announced after mid-November.